I think just about every person I know wishes that they had whiter teeth. We are a society that thrives on caffeine (coffee, soda and tea), we have a ton of smokers and drinkers, and we just don't take care of ourselves like we should. Add this to the fact that dental care in America is ridiculously expensive even with insurance, and the result is most Americans have yellowish (or worse) teeth. Luster can help! This system has been independently clinically proven to be safe and effective. So, how do you use this system? It is surprisingly easy. 2. Brush the Super Whitening Gel individually onto each tooth that you want to whiten.Wait 20 seconds. 3. Hold the Activating Whitening Light directly in front of your teeth and press the button (it will turn on for a full 2 minutes). I really love this system. 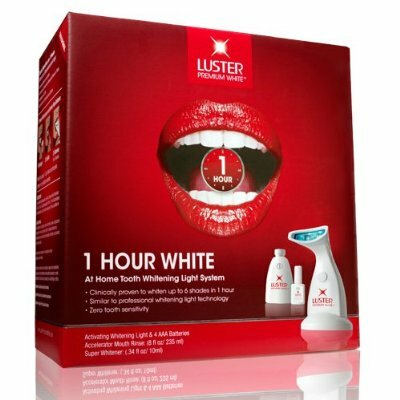 It actually works after only a few treatments, so more that likely you will not need an hour to whiten your teeth. I really love that the Activating Whitening Light automatically shuts itself off. This keeps you from having to juggle a timer while holding it up to your teeth. I found the whole system super easy to use. So, lets talk about the process. I brushed my teeth and flossed before starting (and yes before the pictures). Then, I poured 10ml of the Accelerator Mouth Rinse into the plastic cup that comes with the system and swished it into my mouth. I actually really like this mouth rinse. It is a minty flavor and it felt like it helped to clean my teeth as I was swishing it around. I spit out the rinse and grabbed the Super Whitening Gel. This Gel is in a white-out type bottle and is actually more like a liquid than a gel. As I put it on my teeth, it bubbled a tiny bit around my gums. This stuff actually burned my gums, tounge and lips a little. However, I think it may just be me personally. 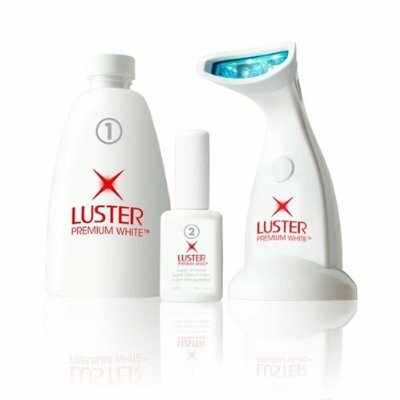 My Husband also couldn't wait to try Luster 1 Hour White and the Super Whitening Gel did not burn him at all. I quickly brushed it on my teeth, waited 20 seconds and moved on to the light. The Activating Whitening Light sits in a holder while you are not using it. I simply picked it up, put it in front of my teeth and pressed the button. I think I may have been holding it too far away on my first try. With my second and third treatment I put it right up to my teeth. The reason why I only did 3 treatments was because my gums and lips were too irritated to do anymore. However, after I stopped I realized that 3 treatments were enough. As you can see by my pictures, it whitened my teeth considerably. Despite my sensitivity, I will definitely be using this again in the future! I am so amazed that this reasonably priced and easy to use product works so well. No Doctors appointments, no spending hundreds of dollars for professional whitening, no nasty strips that you have to leave on your teeth for ages. This amazing system sells for about $39.99! They are currently out of stock on the Luster site, but you can keep checking back or buy it from Amazon or a few other places on the web. Less than $40 for beautiful white teeth, you can't beat that! Disclaimer: I received the above product(s) in exchange for this review. I was compensated in no other way. The thoughts here are my own honest opinions.